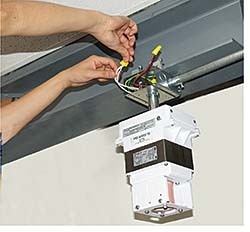 The access box enables overhead lighting fixtures to be installed by only one person. The box is first installed with the side and cover plates removed. The lighting fixture then is attached to the cover plate, which slides back into the box. When the fixture is in place, the wiring can be completed, and the side plate can be screwed into the box. It is adaptable for installation of other devices, such as sockets. Cover plates are interchangeable and include swivel styles.